Fibre: Loop Lux Bullseye Bump (25% Cashmere, 25% Silk, 50% Merino) Yarn: ~261yds chain-plied, slightly heavier than sock weight Method: Wheel spun with long draw Completed: September 21, 2017. The bullseye bump was a centre-pull, lovely ribbon of spinning fibre! 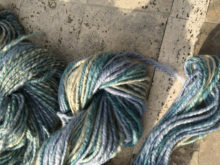 Fibre: Into the Whirled “Studio West” colourway on 60% Polwarth, 40% Tussah Silk. approx 12oz fibre. Yarn: ~419.3 yards of 3-ply, DK-weight; ~93 yds of chain-ply, leaning toward chunky weight. Method: Wheel spun with long draw Completed: October 15, 2016.